It's that time of year again! Six Flags has announced all their New 2018 Rides/Attractions for EVERY park Nationwide. Scroll down below to find out what your home Six Flags park is slated to receive! "This world’s first of its kind inverted looping coaster features continuous inversions along a vertically stacked figure eight track. The ride features multiple head-to-head high flybys at combined speeds of 70 miles per hour for the ultimate dueling adventure ride. 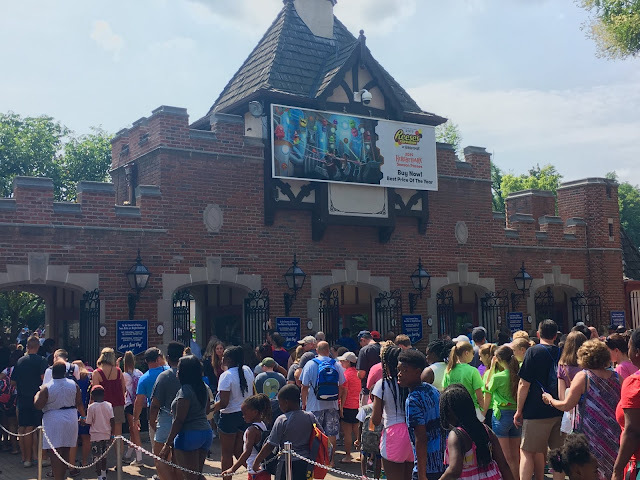 HARLEY QUINN Crazy Coaster takes thrills to a whole new level, as two trains race forward and backwards then charge each other head-to-head to create a dueling riding experience that only Six Flags could deliver. The dueling trains with 32 riders seated face-to-face, race repeatedly around a 360-foot circuit of lemniscate (figure eight) track. A tantalizing “High Five” moment – when the two high speed trains pass each other at a combined speed of 70 miles per hour giving the illusion that riders can actually reach out and “high five” the other riders as they careen by. HARLEY QUINN Crazy Coaster will be located across from THE JOKER and adjacent to SUPERMAN Ultimate Flight." "Waterworld Concord, which rejoined the Six Flags portfolio of parks earlier this year, will debut its biggest new attraction in over a decade with the introduction of Splashwater Island, a colossal and cutting-edge new, interactive water play area opening in spring 2018. 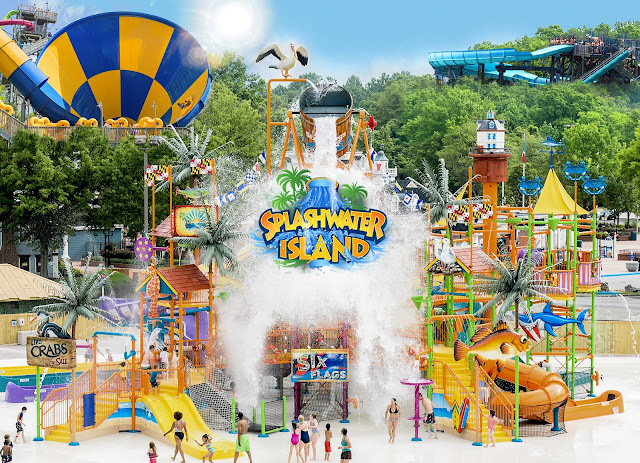 The new Splashwater Island is a mammoth, multi-level play structure with tons of water features covering almost 8,000 square feet to keep families entertained all summer long. Guests will climb up ladders, splash down 600 feet of open and enclosed slides, and navigate a maze of varying platforms and net structures. Guests will stay cool by playing under waterfalls, spouting geysers and spraying fountains. A super-sized tipping bucket sits atop the huge play structure dumping water on everyone standing underneath. One of the park’s most popular attractions—the thrilling Tornado, will be integrated into the entry portal of Splashwater Island. Additional guest amenities will also include additional deck space, private cabanas, and new restrooms." 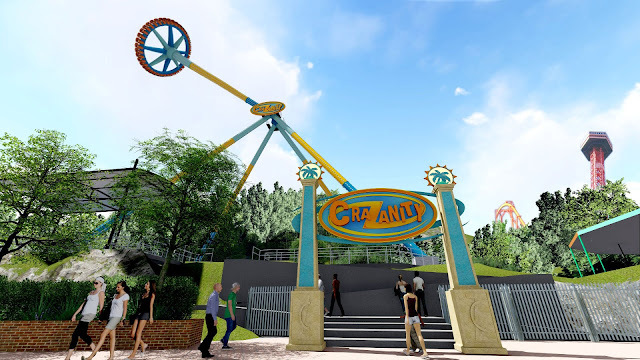 “Six Flags Magic Mountain, the undisputed Thrill Capital of the World, today unveiled plans for a crazy fun 2018 when CraZanity, the world’s tallest pendulum ride, makes its debut in late spring. At a record-breaking 17 stories in the air, this impressive giant disk will reach speeds up to 75 miles-per-hour, as it whips back and forth—higher and higher to give riders a staggering view of the world below them. Enhanced Bumper Cars, renovated attractions, dining, games and shopping. 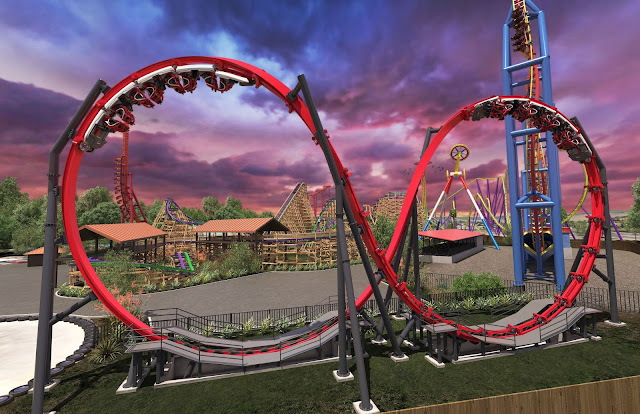 “Six Flags Great America, the Thrill Capital of the Midwest, has an announcement of epic proportions. 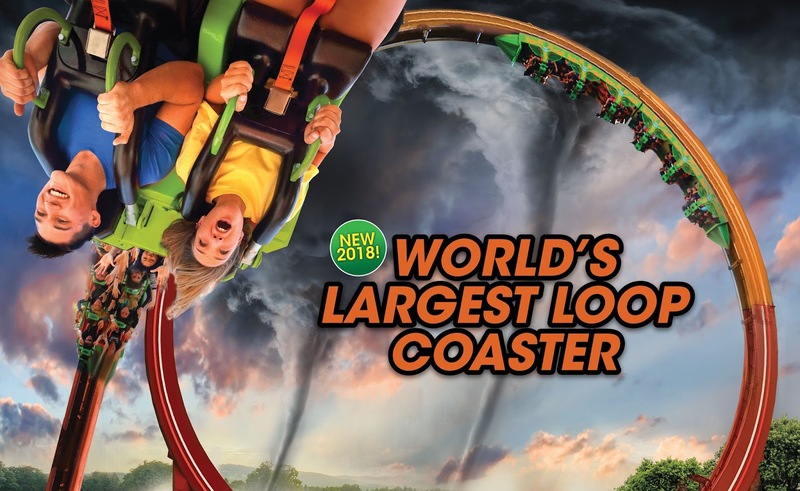 Coming in 2018 is the world’s largest loop coaster. This world-record breaking attraction will take riders forward and backward on a gigantic loop before suspending them completely upside down for plenty of wicked hang-time. This ride will have riders traveling in unique “face-off” seating. 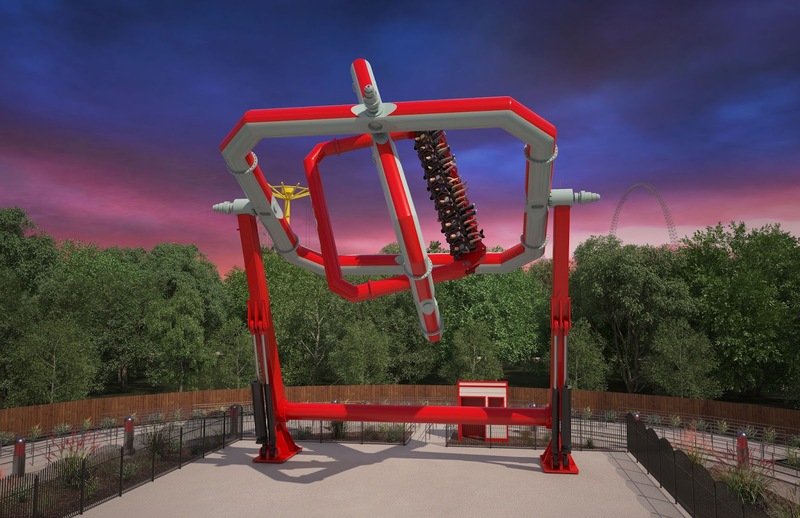 Thrill seekers will go through a whirlwind series of 360° revolutions suspended upside down for the most insane, inverted hang-time of any coaster in the park before reeling down in the opposite direction. "Six Flags St. Louis, the Coaster Capital of Missouri, announces Typhoon Twister, a massive new water attraction, headed to Hurricane Harbor in 2018. This hybrid, zero-gravity slide complex packs two extreme slide thrills into one amazing attraction. Typhoon Twister features four-person rafts that careen wildly into a 125-foot long whirlpool bowl that spins riders around 360 degrees before the bottom drops out, sending guests plummeting down an enclosed five-story drop. Storm chasers will then be propelled up a 45-ft. zero-gravity wave wall to experience moments of weightlessness before falling back down and shooting out into the splash pool below. Pumps 300,000 gallons of water per hour. 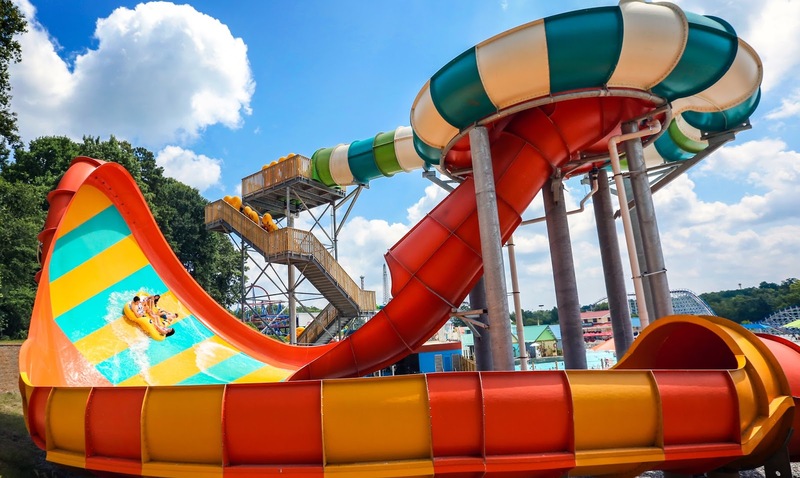 Typhoon Twister, scheduled to make landfall in May 2018, is the latest addition to the 12-acre water park which is offered free with theme park admission. Riders must be a minimum of 48” tall to brave Typhoon Twister"
"Six Flags Over Texas, the Thrill Capital of Texas, in partnership with Warner Bros. Consumer Products, on behalf of DC Entertainment, announces the next generation in thrill rides and the first-of-its-kind in North America—HARLEY QUINN Spinsanity. Staying true to its namesake, DC iconic Super-Villain HARLEY QUINN and inspired by the movement of a gyroscope, this ride promises to deliver a new level of thrills with unpredictable, gravity-defying flips, twists and turns. HARLEY QUINN Spinsanity features a unique futuristic triple box design that allows the gondola to spin around three separate axes while rotating forward, backwards and sideways simultaneously at up to 70 feet in the air. Seated 24 across with over-the-shoulder harnesses, riders will experience a thrilling combination of negative and positive gravitational forces. By night, the attraction promises to light up the North Texas skies beckoning thrill seekers from near and far. Located in the GOTHAM CITY section of the park. HARLEY QUINN Spinsanity is expected to debut in spring of 2018." 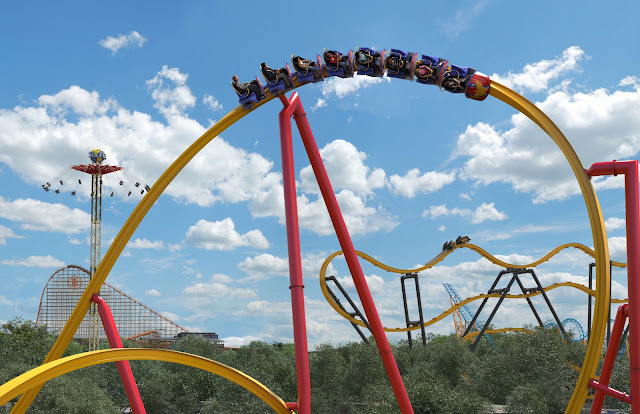 Six Flags Fiesta Texas will debut the one of the world's first single rail coasters: Wonder Woman Golden Lasso Coaster. "Six Flags Over Georgia—the Thrill Capital of the South—today announced the all-new Twisted Cyclone hybrid roller coaster will arrive in 2018. Twisted Cyclone will offer guests the best of both worlds—a classic wooden structure combined with a modern, steel track for multiple inversions and a smoother, more thrilling riding experience. A smoother, sleeker, more intense ride than ever before. Construction on Twisted Cyclone is underway and the ride is expected to debut in the spring of 2018." 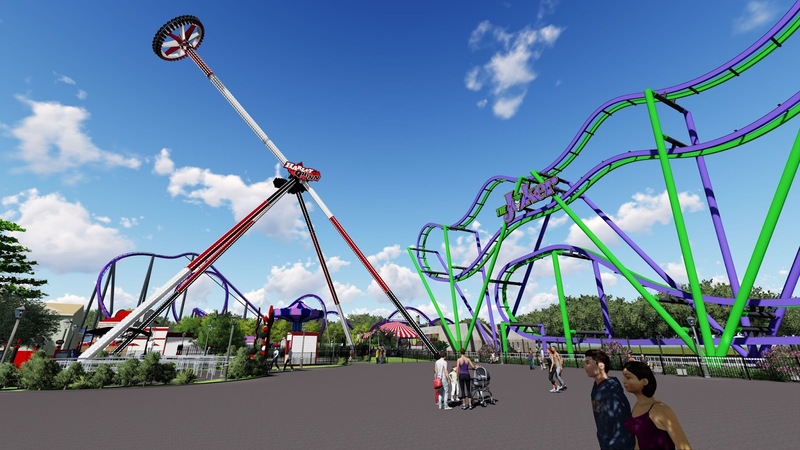 "Six Flags New England, the Thrill Capital of New England, in partnership with Warner Bros. Consumer Products on behalf of DC Entertainment, today announced its newest attraction, HARLEY QUINN Spinsanity, to open in spring 2018. Inspired by The Joker’s partner-in-crime, this ride promises to deliver epic thrills each time guests experience this villainous, new addition. HARLEY QUINN Spinsanity is an extreme pendulum ride that will swing guests back and forth, higher and higher, at up to 70 miles per hour on a dizzying journey that will leave riders feeling as wild and out of control as HARLEY QUINN herself. As guests swing higher and higher, they will experience a feeling of weightlessness at 147 feet in the air before plunging down from 15 stories. 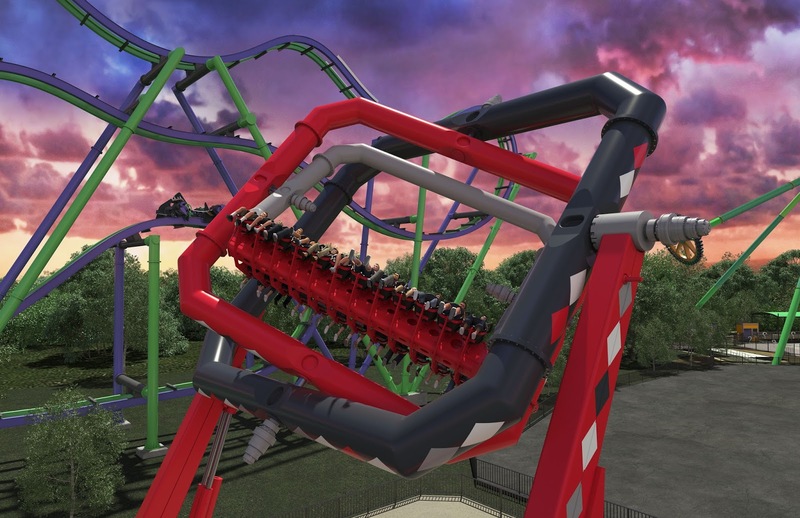 HARLEY QUINN Spinsanity will be located near the park’s newest attraction, THE JOKER 4D Free Fly Coaster, which opened earlier this year"
"Six Flags Great Adventure, in partnership with Warner Bros. Consumer Products, on behalf of DC Entertainment, today announced that it will premiere the world’s first thrill ride themed to the DC Super Hero CYBORG in 2018. Inspired by the movement of a gyroscope, CYBORG Cyber Spin will deliver an unrelenting and intense anti-gravity experience as it whirls guests on three axes high above the ground. CYBORG Cyber Spin features a unique futuristic triple box design that allows the gondola to spin around three separate axes while rotating forward, backwards and sideways simultaneously at up to 70 feet in the air for intense and continuous movement. Seated 24 across with over-the-shoulder harnesses, riders will experience a thrilling combination of negative and positive gravitational forces. By night—this bold, new attraction promises to light up the New Jersey skies beckoning thrill seekers from near and far. · Located in Metropolis adjacent to JUSTICE LEAGUE: Battle for Metropolis. 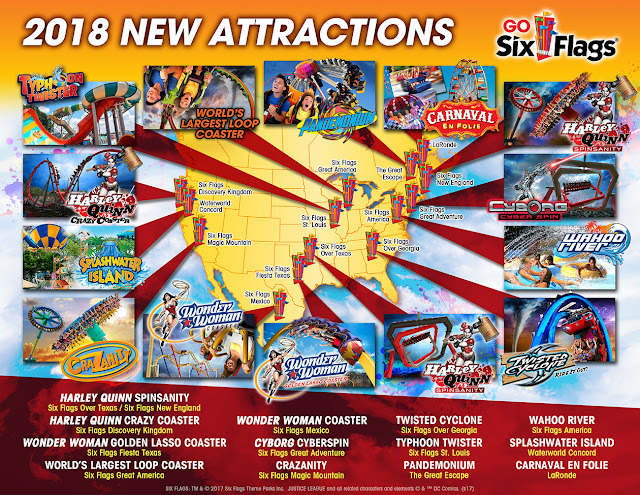 CYBORG Cyber Spin is expected to debut in late spring of 2018"
"Six Flags America, The Nation’s Capital of Thrills, today announced that it will debut Wahoo River, an all-new action-packed river adventure, in its water park for the 2018 season. The park’s existing Castaway Creek will be completely removed and replaced with the Bigger, Better and Wetter Wahoo River. Park guests will be thrilled with major enhancements such as a faster current, immersive rockwork theming, huge waterfalls, and tons of interactive, splashing thrills around every turn. 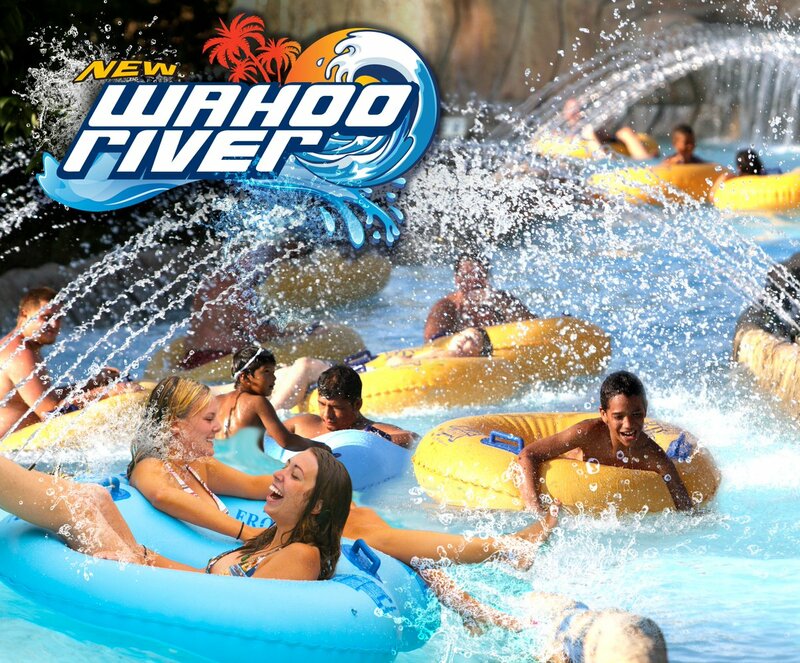 Wahoo River will be 33% wider and over 40% longer than Castaway Creek. 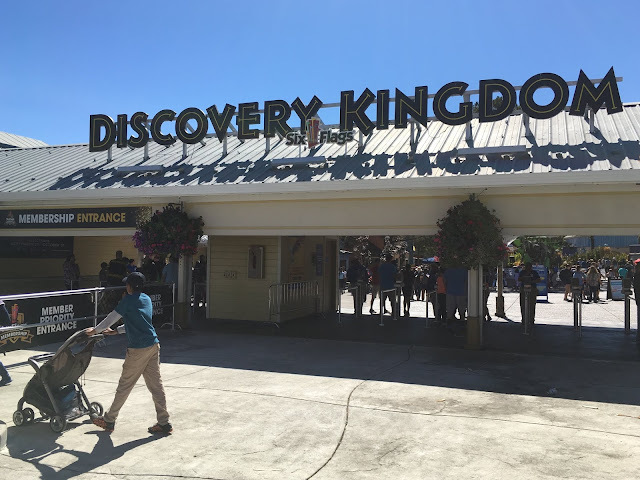 The new attraction will include significant upgrades such as a zero depth entry that will make it convenient for guests of all ages to slip into the cool water with inflatable tubes. Friends and family members will have a blast as they float along the river, encountering wall sprayers, aqua archways, tippy water cones and a new wave generator. The journey continues under graceful water arches spanning the entire width of the river—as guests find even more surprises behind the rock waterfall, through the leaky pipes and under the leaky bridge waterworks. Nearly 2,500 feet of new deck space with hundreds of deck chairs. 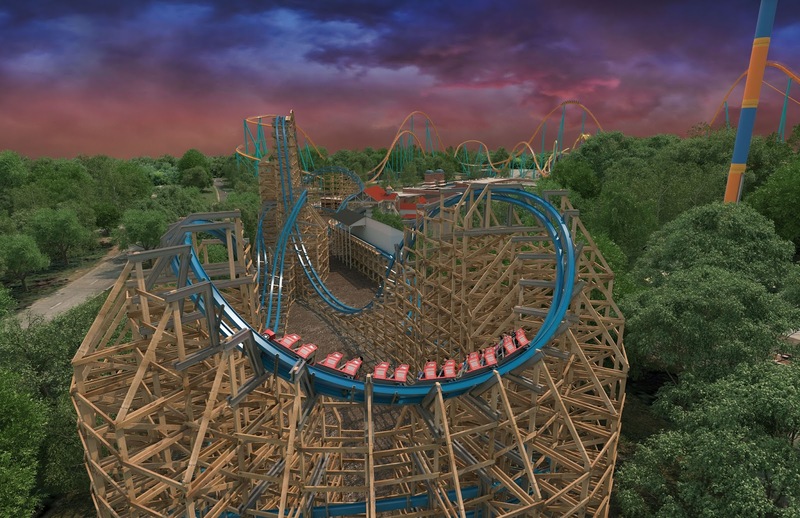 Wahoo River is scheduled to debut in spring 2018"
"Six Flags Mexico is launching its first ever 4D Free Fly Coaster in 2018. 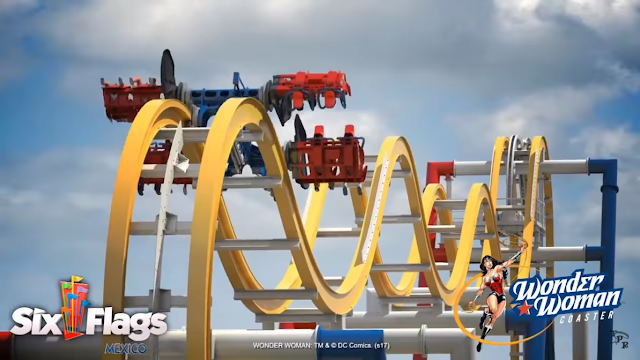 This uniquely designed roller coaster will feature theming based on DC’s iconic Super Hero—WONDER WOMAN. 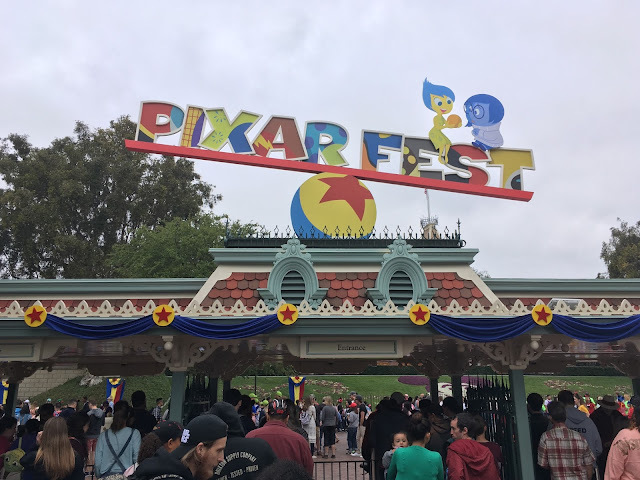 On the new WONDER WOMAN Coaster, riders are lifted straight up a 12-story, 90-degree hill and then immediately flipped head-over-heels, backwards and forwards multiple times as they speed along the undulating vertically stacked track. The technologically advanced Free Fly design allows cars to be extended outward from the track as riders sit suspended in mid-air. Two beyond 90-degree raven drops give the sensation of heart-pounding free-falls from high above the ground." "La Ronde, in Montreal, is celebrating all things family with Carnaval en Folie—a new carnival-themed family zone, complete with three, fun new rides sure to delight the young and young at heart. Guests will be fully immersed in an atmosphere inspired by fairs and carnivals of yesteryear featuring rich, vibrant colors and festive music and lighting. 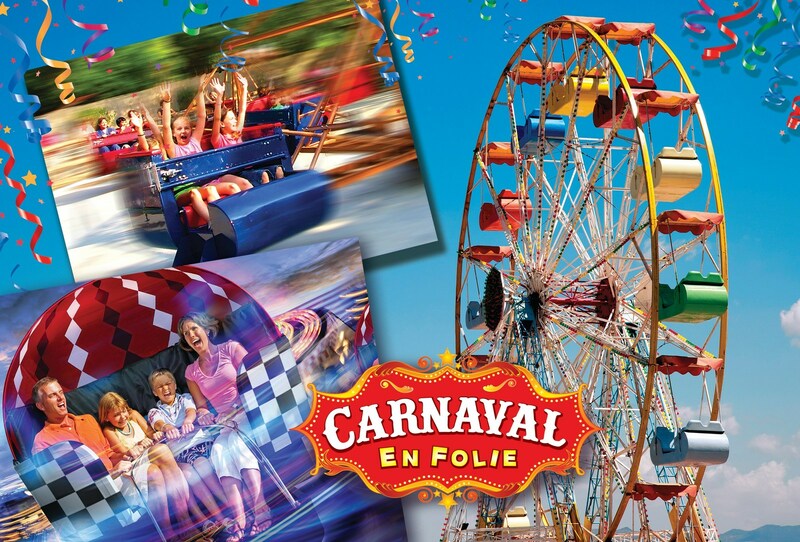 Torsade is a spinning tilt-a-whirl where parents can ride with their children; Petit Roue is a fun-size Ferris wheel that offers the best view of the Carnaval; and Tourbillon is the perfect ride for thrill seekers in training." 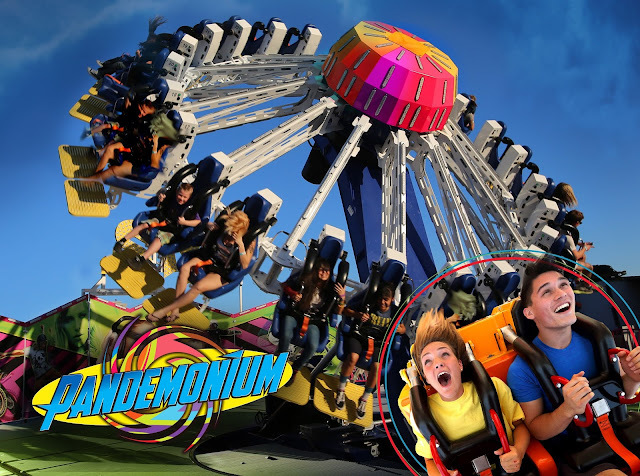 "Complete Pandemonium is headed to The Great Escape and Splashwater Kingdom. On this classic spinning attraction, riders will catch maximum air and experience 360-degrees of adrenaline-packed excitement. Pandemonium will seat 24 rides in a “face out” position as it lifts, spins and tilts at all angles. The ride quickly accelerates faster and faster, while whirling guests through seemingly endless rotations. An electrifying light package will dazzle onlookers and riders alike."